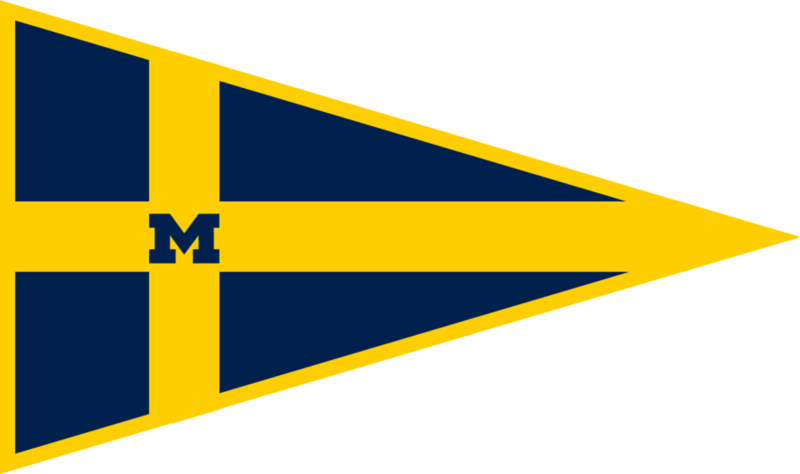 The Michigan Sailing Team is run entirely by its elected executive board and general membership. If you have any questions or comments please contact the executive board or the team captains. Sarah joined the team at the beginning of her freshman year and has enjoyed competing across the Midwest and East Coast ever since. She learned to sail when she was 11 years old at a summer camp in Washington, but most of her sailing experience before college was gained at Hickam Harbor and Waikiki Yacht Club in Hawaii. She was a skipper and crew in 420’s for her high school team, and she is currently a skipper on the women’s team at Michigan. During the summer she enjoys racing her family’s Viper 640 on the Long Island Sound. Kyle joined the team as a freshman and has enjoyed becoming a competitive sailor since. He has sailed with his family in the past on their Flying Scot on lakes across Michigan. Since then he’s done 5 Mackinac Races, 1 Queen’s Cup, and many other regattas on the Great Lakes. Outside of the team Kyle primarily races keelboats. He races 5+ days a week in Detroit from May to October and has raced both inshore and offshore on everything from J70’s to Santa Cruz 70’s to an ORMA 60 Trimaran. Murphy started sailing on a Beneteau First 42 out of Port Huron Yacht Club when she was 13 years old. Since then, she has regularly sailed various types of keelboats during her summers and with the team. Additionally, she has learned to crew at a variety of dinghy events. Murphy has enjoyed traveling across the Midwest and East Coast with the team, and she cannot wait to help the team in her role as Fundraising Chair. Jenna is a freshman from Buffalo, New York. She grew up sailing Bics, 420s, and Lightnings on Lake Erie at the Buffalo Canoe Club. She also sailed FJs while competing for her high school team. The past two summers, Jenna has enjoyed coaching sailing at the Buffalo Yacht Club. Jenna loves sailing and is looking forward to the rest of her time on the team. Max is from the mighty town of Saline, Michigan but likes to say he is from Ann Arbor. Max grew up and taught sailing in Northern Michigan, and has sailed on a variety of keelboats in the area. Some of his hobbies outside of sailing include Microsoft Excel, cooking, and playing with lightsabers. Maggie is from Chicago and learned how to sail when she joined the team her freshman year. Since then, she has focused on becoming a competitive crew. Over the summer she gained more on-the-water experience at the Chicago Yacht Club, where she worked as the regatta manager’s intern. Maggie is excited to develop the skills she learned over the summer and from other teammates throughout the rest of her college career. Jake is a sophomore from Grosse Pointe, Michigan. He has been sailing for 7 years out of Bayview Yacht Club and for Grosse Pointe South High School. Upon joining the sailing team, Jake has been a heavy crew, traveled to Nationals, and competed in many of the East Coast interconference regattas. He has also been active in the Detroit sailing community, on the J120 Jayhawker. He raced in the Chicago Mackinac Race this past summer and managed to be the first boat in the race to get to Holland. Jake brings a lot of experience in developing sailors as he has been a junior coach at Bayview for the past few years.